Looking for something fun AND cheap to do this weekend in Las Vegas? Well, "fun" and "cheap" are what Casino Boy does best. (Seriously, you should meet his ex-girlfriends.) CB's got five things you can do this weekend - and any weekend, really - if you're hoping to have fun on a budget in Las Vegas. Downtown Las Vegas is popular with the Cheapo crowd, and with good reason. The slots are (seriously) looser, the drinks aren't as pricey and the crowd is a lot less tourist-y. Plus, Downtown Vegas is where you'll find the Fremont Street Experience, which is home to the best free light show in town and some of the most curious interesting people watching, well, anywhere. Check out their website for information on FREE concerts and upcoming events, and be sure to check out the famous zip-line that, well, ZIPS above the street throughout the day and night. There's always something happening on Fremont Street - just make sure to bring your camera. Trust us on that one. Especially if you're a Las Vegas first timer, you'll want to check out all the famous and FREE Las Vegas fun that the city is known for. 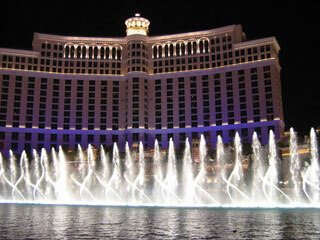 You can see the awesomely bad Sirens of TI show each night outside of Treasure Island at 5:30, 7, 8:30, 10 and 11:30pm. Then there's the ever-changing Botanical Gardens at the Bellagio. (AND you can pretend you're rich for an hour while you're there.) Further down the Strip, there's the Fall of Atlantis Fountain Show at the Caesars Palace Forum Shops, (Water! Statues! Feel the excitement!) and across the street you can kick it with some real pink ladies at the Flamingo Habitat at the - wait for it - Flamingo Hotel. And just a few doors down, you can see Big Elvis at Harrah's play the hits most afternoons. (It's exactly what you think it is.) And of course, you can always just grab a drink at the Cabo Wabo and watch tourists get eaten alive (not literally) by card snappers and swindlers on the Planet Hollywood steps. A true gem if there ever was one, the Pinball Hall of Fame is free to get into (they're a non-profit; yes, those exist in Las Vegas) and is home to dozens of vintage pinball machines that will have you reminiscing about the "Happy Days" of the '50's and '60's.